Every person has their own way of processing and sharing information. Every person is also a mixture of introvert and extrovert. Some people, however, prefer the introvert way of learning and behaving. Susan Cain described a manifesto for introverts in her book Quiet: The Power of Introverts. Below are some of the themes she outlined. You can discover more via her website. As we are all a mixture of introvert and extrovert, we may or may not demonstrate all of these behaviours. But here are some signs that may point to you being an introvert. You like being alone or with a few trusted people. You like to talk about things in depth, rather than do small talk. You like to be in the right environment to do your work, rather than get distracted by noise and other influences. You like to reflect on things and process them in your own time. You like to think carefully before you speak and sometimes rehearse the script of what you are going to say. You sometimes go into your professional role and may appear to be extrovert, but you then regain strength by spending time alone. You prefer to be an expert on a particular topic, rather than spread yourself too thinly. You like to set aside a block of time to immerse yourself fully in your work, rather than having to be social and talk with people who interrupt. 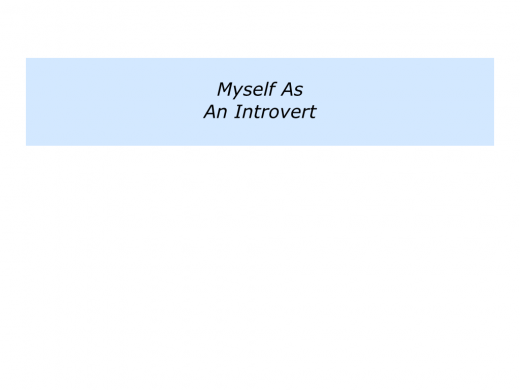 Looking at your own life, do you have some of the characteristics demonstrated by introverts? How do these manifest themselves in your daily life and work? If you wish, try tackling the exercise on this theme. 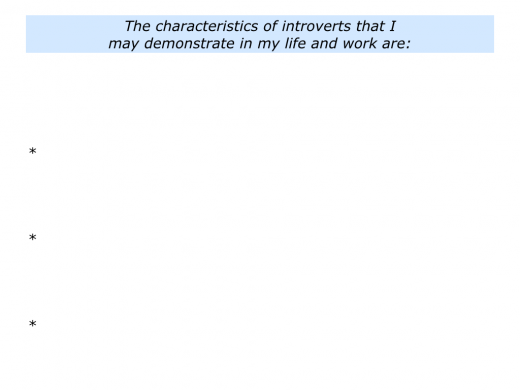 This invites you to describe some of the characteristics of introverts that you may demonstrate in your daily life and work. Introverts enjoy their own company, but sometimes they enjoy going into professional role. They may be quiet at home, for example, but take charge when moving into the role of doctor, carer, trusted advisor or other professional role. Such a person can feel comfortable because they have clear guidelines and maybe a clear script to follow. The role provides a chance to pursue a clear purpose and perhaps help other people. To follow guidelines that are based on what works. To follow a script that they can adapt in their own way. To follow principles that enable them to channel their personality towards achieving success. Carol is somebody I worked with who seems to have two different personality styles. At home she loves to spend time alone reading, making pottery and working in the garden. She enjoys the sense of peace and time to reflect. She has a different style at work. Carol has pursued a nursing career and is now Matron of an Accident and Emergency Unit. This calls for her taking charge. She feels comfortable moving into the leadership role and dealing with crises. She is also happy making key decisions regarding clinical matters and resource allocation. In the old days it was thought that extroverts made the best leaders, but now people see a much fuller picture. 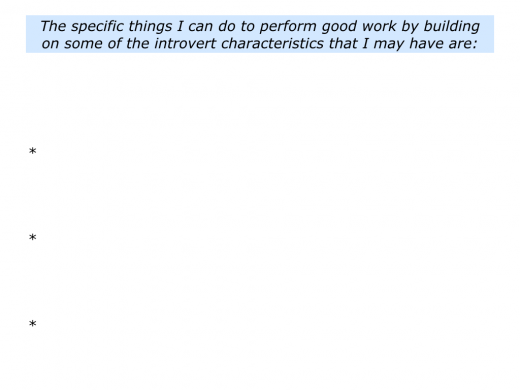 Introverts can also be excellent leaders. Jennifer Kahnweiler outlined this approach in her book The Introverted Leader: Building on your quiet strength. Below is a video that provides an introduction to the book. You can discover more via her website. Rahul Sinha has also highlighted the influence that introverts have in many fields. They may work as thought leaders, writers, artists, philosophers or whatever. He reports that sociologists say that even the most introverted person influences 10,000 people during their lifetime. 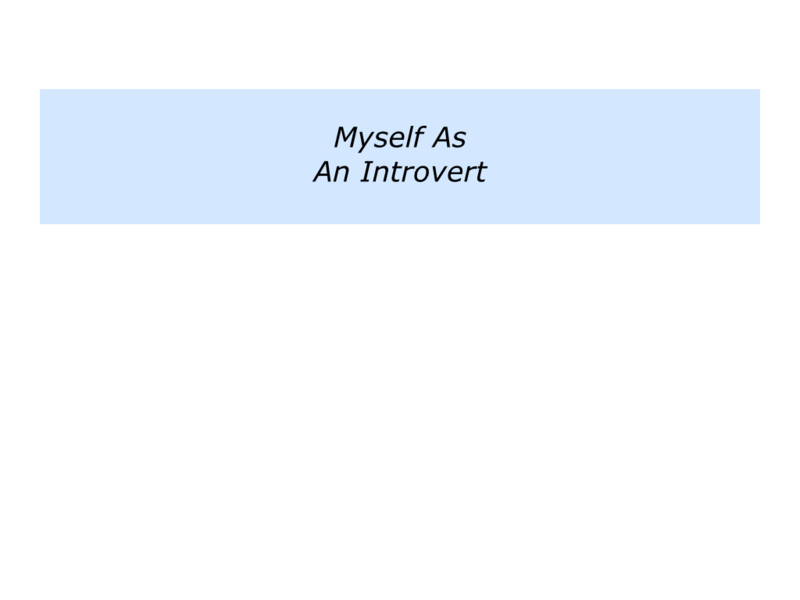 He says that 55 to 60 percent of males and 50 to 55 percent of females are introverts. He also says that 40 percent of executives are introverts. Rahul goes on to explain why introverts sometimes make great leaders. Below are some of the headlines. You can read the complete article on Linked In via the following link. To my surprise, I read and heard this from many successful executives. They also confess at some point in their journey they had to work to overcome being overlooked or misjudged because of their quietness. 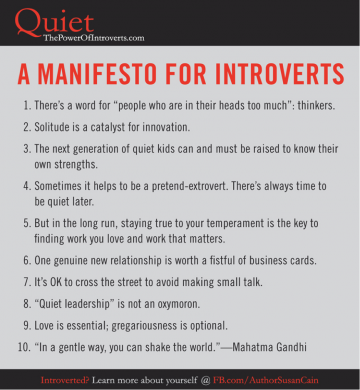 Here are the six reasons why introverts can be great leaders. 1. They are better listeners. 3. Introverts are the wizards of preparation. 5. They put the emphasis on deepness. 7. Introverts can influence others. David Zweig has also shown how quieter people can be fine professionals and leaders in his book Invisibles. Here is an extract from an article he wrote for the Quiet Revolution website. You can discover more via the following link. In my book Invisibles, I profiled a number of highly accomplished professionals who remain largely behind the scenes. Many of these people lead large teams of workers and have positions of great authority within their fields or organizations. And yet almost all of them are understated and self-effacing – certainly not traits typically associated with leadership. It’s this personal humility that so often gets overlooked as a critical trait for great leaders. Here is more background to David’s book. You can discover more via the following link. For most of us, the better we perform the more attention we receive. Yet for many “Invisibles” – skilled professionals whose role is critical to whatever enterprise they’re a part of – it’s the opposite: the better they do their jobs the more they disappear. In fact, often, it’s only when something goes wrong that they are noticed at all. David Zweig takes us into the behind-the-scenes worlds that Invisibles inhabit. 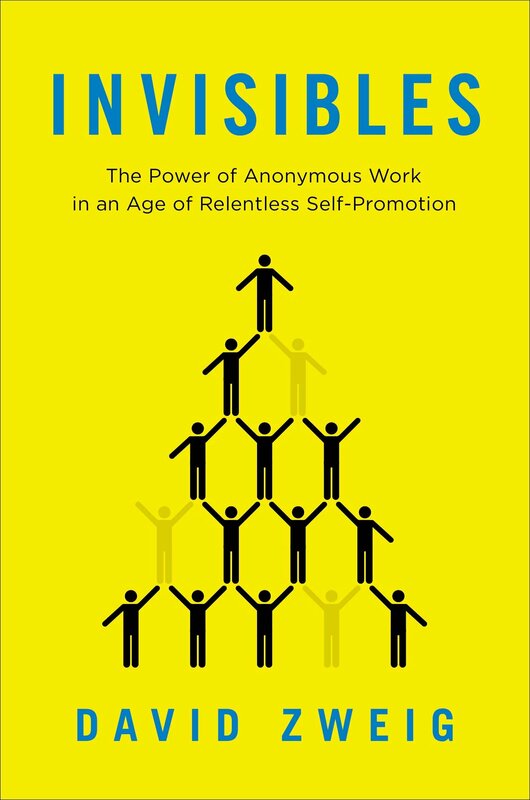 He interviews top experts in unusual fields to reveal the quiet workers behind public successes. Along the way, Zweig reveals that Invisibles have a lot to teach the rest of society about satisfaction and achievement. What has been lost amid the noise of self-promotion today is that not everyone can, or should, or even wants to be in the spotlight. This inspiring and illuminating book shows that recognition isn’t all it’s cracked up to be, and invisibility can be viewed as a mark of honour and a source of a truly rich life. Let’s return to your own life and work. 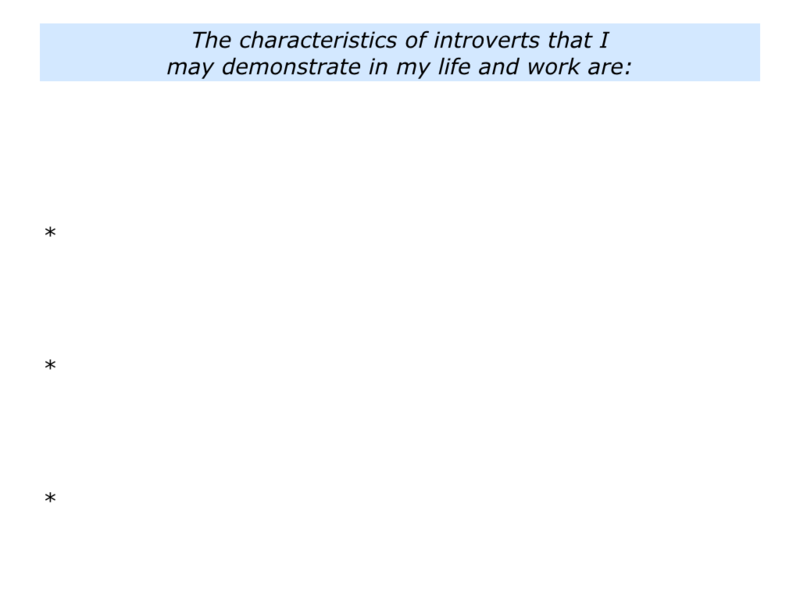 Imagine that you have some of the characteristics associated with introverts. 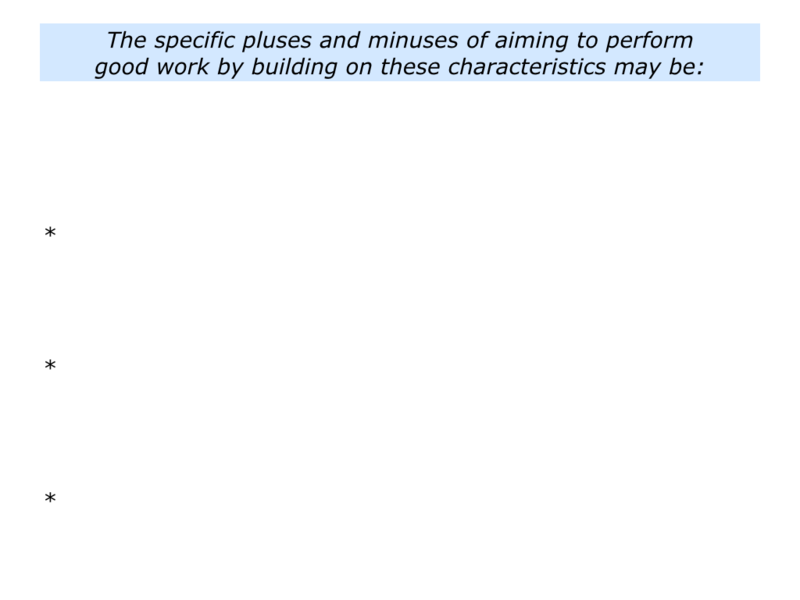 Looking ahead, how can you use these qualities to continue to do good work? What will be the pluses and minuses of taking this route? 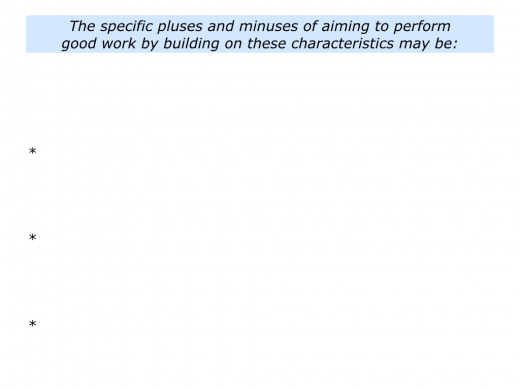 How can you build on the pluses and minimise the minuses? Very interesting post, Mike. I can relate with a lot of that. There is a constant conflict of whats inside of me and what people want to see more of before they give me credit for anything. It can be either demoralising or empowering. Luckily in my case it’s the latter.